Well, now that we have, somewhat, figured out how well prey-looking dinosaurs saw we can move onto how well their enemies, the predator, saw. However, before we move on, I need to make one quick little note about classifying dinosaurs as prey vision or predator vision. As can be expected in God’s creation, every dinosaur’s head is unique. And, because of that, not every one has the same kind of obstructions for prey vision or predator vision. For example, a Brachiosaur sauropod might have a lot less snout and face in front of his eyes so that gives him more range than the Triceratops who has a whole truckload of face in front of his eyes. Each and every dinosaur is different so the exact classification of prey vision or predator vision may be more in general instead of specific. So, to get on with our research . . .
Dr. Kent Stevens, of which I mentioned in the last segment of this series, has taken seven predatory dinosaurs and had lifelike reconstructions made of their heads. 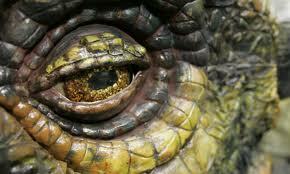 He inserted eyes into these replicas and then lasers into the eyes, just like with what he did with Triceratops. 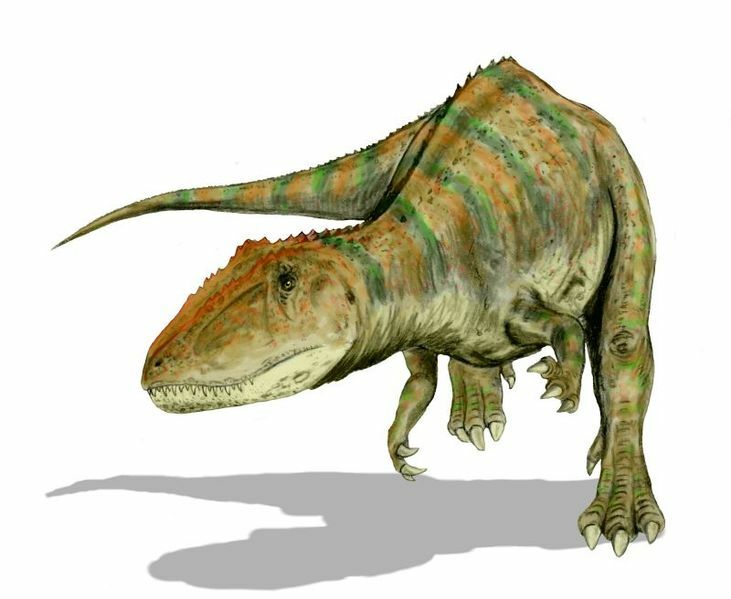 Carcharodontosaurus had limited vision range. Photo from Wikipedia. In Dr. Stevens’ abstract he immediately states that Allosaurus and Carcharodontosaurus had limited binocular vision because of the placement of their eyes as well as the shape of the snout. Big Allosaurus had his eyes way too close to his snout and there were just to many obstacles blocking a clear, binocular vision ahead. However, he did have a range similar to that of a crocodile. Carcharodontosaurus too, had his eyes to close to his snout but he was also limited by facial obstructions. These limited his ability to connect both of his eyes in the same range. He, too, had about the same range as a crocodile. However, when it comes to the other dinosaurs, we see a major difference. Since, Velociraptor and Troodon were much smaller predatory dinosaurs and ones with much smaller heads, we can see (no pun intended) that they would have much better range. With bigger eyes and smaller heads, as well as eyes being farther from the snout, Velociraptor and Troodon had a range of 55-60%. That is about equivalent to an owl’s. This surpasses any known reptile’s vision range. Pretty exciting stuff. But let’s get back to the bigger predatory dinosaurs. The only dinosaurs left are Nanotyrannus (not all that big I guess, and some scientists think this could be a juvenile T. Rex), Tyrannosaurus Rex and Daspletosaurus. I couldn’t get a direct statistic on Daspletosaurus but it seems he had a pretty good range of vision. With eyes sixteen inches away from each other, Tyrannosaurus Rex has such a wide range of vision that it exceeds that of a hawk. Nanotyrannus was the only dinosaur in this test that beat Tyrannosaurus Rex’s range. Tyrannosaurs Rex’s range is amazing considering his size and gigantic head. Truly, Tyrannosaurus Rex was the king of the forest. I would have hated to be an animal with prey vision. So, after much studying and comparing, we have finally come to the conclusion that dinosaur’s vision was built a lot like modern-day animal’s. However, some, like Tyrannosaurus Rex, had an even better vision range that many living today, which is a landmark discovery at the very least. If there is one thing about dinosaurs that I absolutely love, it is studying how dinosaurs would have lived in their world. Granted, it was the same world as today but I just can’t help but love exploring just how dinosaurs lived. I specifically love the experiments and scanning they do on the skull to determine many interesting facts. Fortunately, dinosaur vision is a pretty straightforward conclusion that requires little “hard work”. Let’s dig a little deeper. First of all, we discovered how a animal with its’ eyes on either side of its’ body normally does not have depth perception. However, they do have a wide range of visual coverage. This limited but expansive vision is both a good and bad thing. It is good because the animal can cover a much wider range with its eyes while eating. The only blind spots, for an animal with eyes on the side of its’ head, are the bit in front of the nose and behind the tail. Of course, those blind spots can quickly be covered if the creature moves its’ head. So, which dinosaurs had eyes on the side of the head? We got quite a list. Anklyosaurs – You know, the big, armored dinosaurs with the big, clubbed tails. Sauropods – These guys are the giants, herbivorous, long-necked dinosaurs and probably did not have such great sight to begin with. 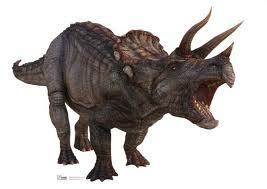 Ceratops – The Triceratops is the most famous of this group. Like most animals today, it has been tested that these guys had the prey vision. Now, each one of those categories covered many, many dinosaurs but there are many more out there that had prey vision, but, for now, I want to talk about that Ceratops group because there has been some exciting research done in that group. A Mr. Kent Stevens has decided to invest some laser equipment to figure out a way to see how Triceratops saw. That doesn’t seem possible . . . does it? Well, I have watched what he did and I’m rather impressed. By using a Triceratops replica, Stevens was able to insert eyes into the eye sockets and insert lasers into the eyes. After mapping out where the eyes could point and what kind of range they could cover, Stevens came to the conclusion that Triceratops, like many other dinosaurs, had a wide range of sight but could not pick up depth or distance very well. On that note . . . I want to explain something a little better. 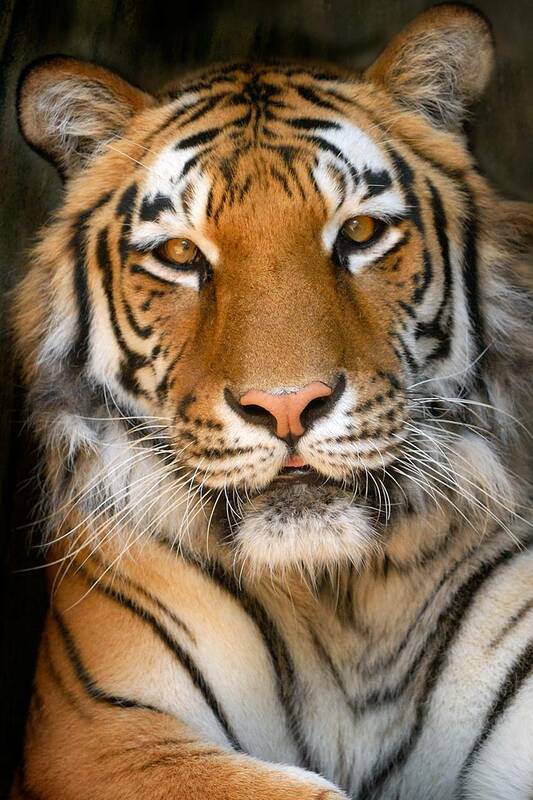 When an animal has eyes on both sides of his face he is picking up two different images. Because of this the animal cannot pick up depth by comparing two different versions of the image, like our brains and eyes do, they do not have the ability to pick out depth and distance. I’d figured I should just let you all know. Anyway, now that we have figured out that the prey vision was in most (I’m still trying to work out those Hadrosaurs), if not all, of the dinosaurs that looked like prey. Therefore, we can conclude, for the prey part of this research, that they were a lot like today’s animals. 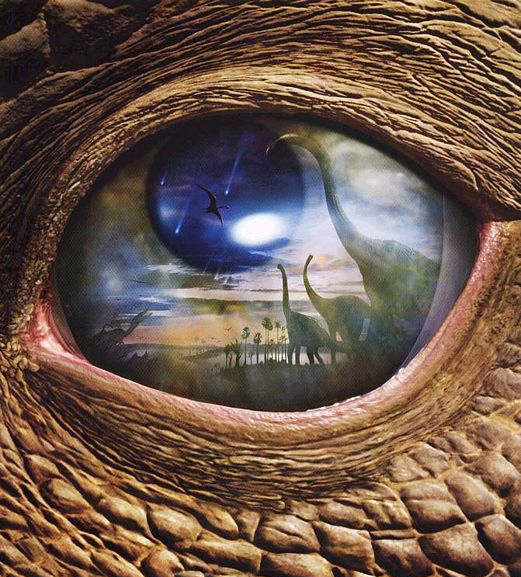 How Well Could Dinosaurs See? Well, that seems like a mighty hard questions doesn’t it? I mean, how could we humans possibly know how well a dinosaur could see when we don’t have living specimens to observe? Now, that does seem like it could cut the whole study down but there is something we do have from dinosaurs: their bones. With these bones/fossils we can place just where the eyes were and study off them from there. Sure, it would be a lot nicer and easier to just pick a hadrosaur and see if he will run into the brick wall in front of him, but, we don’t have that option. So, let’s get studying. However, I will be breaking this study up so I can keep your attention throughout the shocking discoveries. First of all, we have to figure out how today’s animals see and why. Today, for the most part, you have predator and prey. But, something you will almost always see is that the eyes of the prey are drastically different from the eye of the predator. The predator, such as the one on your left, has eyes facing forward. So, you say? Well, when a animal’s eyes are facing forward it usually means that this animal can pick up depth and better distance. In other words, they can see really well. How does this help them? To answer, you have to see (no pun intended) how the prey sees. A usual prey animal has the eyes on the side of its face. This, as we discovered in our article about the horse, gives the prey great range with its sight but not very good eyesight. However, a prey animal does not need high-tech equipment for seeing, he just needs his eyes placed in the right area to see the most possible area he can. And, God has given this gift to prey animals. When two eyes are facing forward on an animal, they now have what we call binocular vision. With two eyes being able to pick up a slightly different view of the same area, the animal’s brain can combine the information and form a picture that uses both of the eyes to perceive better distance and depth. But, when a prey’s eyes pick up images the two eyes are picking up completely different images so, thus, they cannot combine the pictures and make a good judge of distance or depth. The cheetah zeroes in on the impala. The beast is approximately 25 yards away. The cheetah sees it plainly and clearly. The cheetah moves in quickly. The impala is gracefully munching on some grass. Suddenly, out of his nearly 180 degree vision he sees a movement. He can not make out what it is or how far away it is but he knows it is trouble. He bolts as the cheetah bursts from the grass. The cheetah gains top speed and is just two feet behind the impala. With a sudden calculation it knows just where and when to jump. He jumps . . . and takes the impala down. See, for both predator and prey, their vision works just right for their lives. But, what dinosaurs had binocular vision, depth perception, etc. and which ones didn’t? For that, you will have to wait. This statement was made by an evolutionists who believed that dinosaurs, after many years of evolution, evolved into birds. The most famous of these dinosaur descendants would be the group of birds known as Raptors. These birds include, owls, eagles, hawks, falcons and vultures. Theses birds, according to many evolutionists, have similar characteristics to small dinosaurs such as Velociraptor or Eoraptor. However, these similarities do not really exist, in fact, the only remotely shared feature is the legs, and even there they are very different. In order to answer this question we have to explore the differences between feathers and scales. First of all, thanks to fossilized skin, we know that dinosaurs were covered in scales. And, we know today, that birds are covered in feathers and the only scales that are found are on the legs and even these scales are different from dinosaurs. In order to distinguish between dinosaur and bird we first have to distinguish between scale and feather. The scale is a single unit connected to hundreds of others to form a protective covering for the wearer. These scales mainly show in reptiles but can extend to groups of fish, amphibians, etc. The scale is connected together in folds. These folds are creased together to form a sort of flexible armor. These scales are layered very close to each other and they have dips in their sheets of scales that connect with other layers of scales. This gives it mobility and protection. These scales, individually, are very simple and protect the body from water, air, and other enemies to the flesh. Feathers are a wonder to the human mind and few can debate the amazing complexity and beauty of these seemingly simple features of birds. These feathers show mind-boggling design in their structure. The shaft of a feather is the thick “rod” you see that runs straight up (maybe slightly curved) the near middle of the feather. When you have this shaft (A.K.A. rachis) it is split into two different parts, known as vanes. These vanes are the two side of the feather. These vanes are then made up of barbs. These barbs are the small, individual lines of what feels like silk. You can hardly distinguish them from the vanes because they are connected by amazing little barbules that run up and down and on both sides of each barb (anterior barbules run along the top and posteir barbules run along the bottom). These barbules intertwine with the barbules on the next barb and so on and so forth. But, how are these barbules keeping the barbs together? Well, an amazing thing called a hook catches a groove in the opposite barbule. The hook swings over and fits perfectly snug against that groove. There is a small (microscopic, in fact) groove that is in line with the tinier hook attached to the barbule. This hook, when latched with the barbule on the next barb, latches over and connects with that same groove. This groove insures that the barbules will stay together so the barbs can stay together so the vanes can stay one, compact feather! Therefore, as the above descriptions of scales and feathers states, the difference between scales and feathers is astronomical! However, the question remains: did dinosaurs evolve into birds? 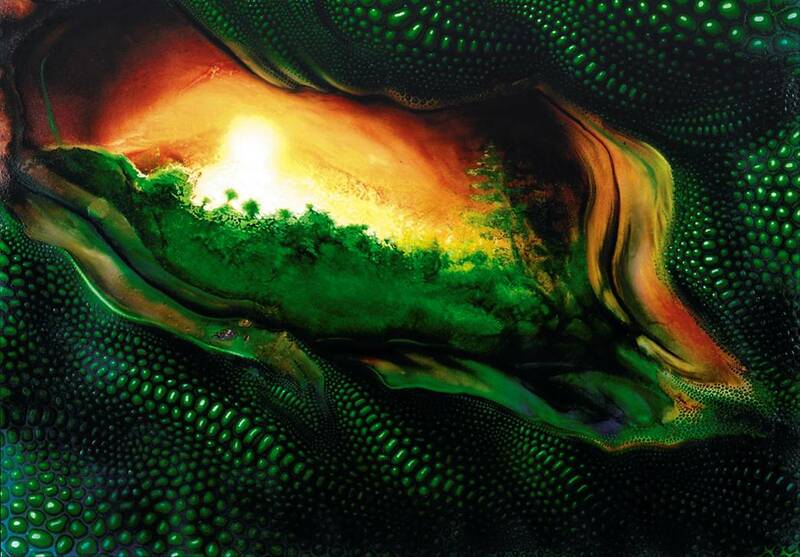 The question can only be answered by the facts; feathers and scales are extremely different and millions of years of evolution, no matter what the conditions, would not change that.